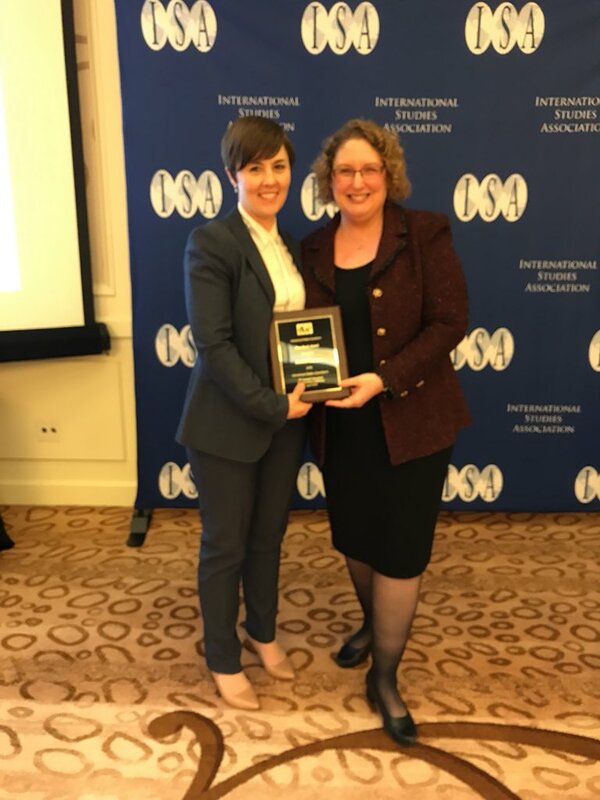 On Thursday, April 5 at the International Studies Association (ISA) 2018 Annual Meeting in San Francisco, Humphrey School of Public Affairs Associate Professor Jessica Stanton received the International Studies Association's annual Best Book Award for her book, Violence and Restraint in Civil War: Civilian Targeting in the Shadow of International Law, published by Cambridge University Press in 2016. 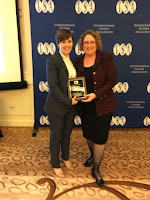 The award, which recognizes the best book published on a topic related to international affairs, was presented by the President of ISA, Ashley Leeds (shown in the attached photo). Jessica Stanton is an associate professor in the global policy area. Her research focuses on international relations, including the causes, dynamics, and resolution of civil wars; the role of international institutions and law in international relations; and criminal accountability for wartime violence and terrorism. Previously Stanton was a faculty member at the University of Pennsylvania. She has held fellowships at the Center for International Security and Cooperation at Stanford University, the John M. Olin Institute for Strategic Studies at Harvard University, and the Christopher H. Browne Center for International Politics at the University of Pennsylvania. Stanton received her Ph.D. in political science with distinction from Columbia University and her BA in international relations with distinction from Stanford University.